The clowns are more than a reminder of life’s ironies, Dr. Phil Gold says. 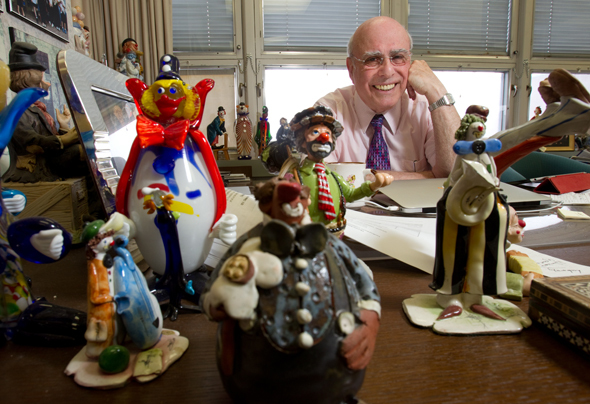 The last thing you’d expect to find when visiting the office of a distinguished physician, researcher and professor is a collection of clowns. The clowns are more than a reminder of the ironies of life, he noted in a recent interview: “It’s about what you see, and what you don’t see about the people you are with. In spite or maybe because of his success, Gold is relaxed and cheerful—a people person who is anything but pretentious, a reflection perhaps of his upbringing in humble circumstances on St. Laurent between Mount Royal and Villeneuve. The son of Polish immigrants, Rose and Jack, Gold remembers not feeling poor or deprived because the family had what the neighbours had, or did not. He remembers being one of the only Jewish families on the block and having to “draw first blood” when faced with street confrontations. Gold worked at Pearl’s Grocery Store on the Main, then as an undergraduate at McGill washing bottles at Molson’s Brewery and selling the junior Britannica. His research breakthrough came in discovering a Carcinoembryonic antigen (CEA), after he heard a talk on immunological tolerance, and he believed he should explore whether there are differences among tumour cells. “It (the test) should never be used without symptoms, but in conjunction with the patient and the history,” he emphasized. 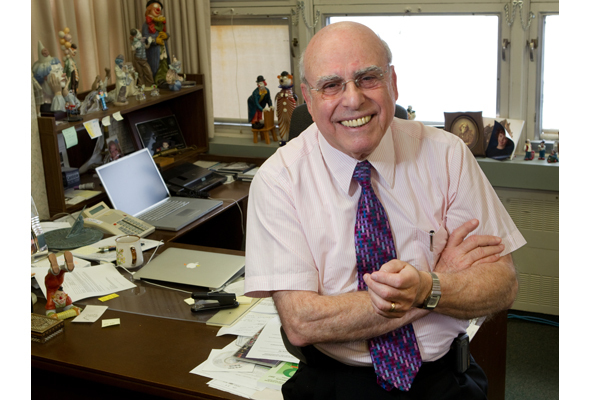 This discovery gave Gold tremendous credibility and standing in the medical research field and enabled him and his colleagues to get funding for such initiatives as McGill’s first HIV clinic, which opened in 1982 when the virus was first described. When it comes to the MUHC superhospital, Gold is enthusiastic, though he laments that it will be smaller than originally envisioned, with plans now for 346 adult single-bed rooms and 154 for children, down from the original 900 beds. “Ambulatory care is better, surgery is shorter, but at the end of the day people are going to get sick. … We need to have more chronic-care facilities,” he says, noting that home-care has its limits. Among reasons emergency rooms are so overcrowded, he says too many hospital beds are being used for patients requiring chronic care. A general hospital is the wrong place for these patients, too expensive at about $1,200 a day. “We had state-of the art 25 years ago, even better, and now we have state-of the art for this time. Going forward, I hope it will be the same. “When you are in the system you are safe. The problem is getting into the system. “People wait. I was told the other day that someone had called another hospital for orthopedic surgery and was told there was a two-year wait. That’s insanity! and we’re complaining about our system? “It’s not great, but it works. The question is how long you hold it together with chewing gum and Scotch tape. We’re still ahead of the game, we still turn out extraordinary research, and provide excellent patient care, but where is it going? As we wrapped up our conversation, I noticed a photo of his wife, Evelyn Katz, and their three children—Ian, Canada research chair in philosophy and psychiatry at McGill; Josie, a Montreal graphic designer; and Joel, a New York City psychiatrist—and seven grandchildren. There are lots of clowns, but one photo of the entire Gold family is clearly his greatest joy. Be the first to comment on "MUHC: Groundbreaking researcher Phil Gold fueled by curiosity and heart"